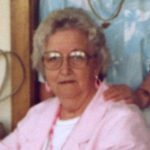 Ethel Mullenix, 94, passed away on January 21, 2019. A visitation will be held at Martins Funeral Home Chapel at 1 p.m. on Friday, January 25, 2019. Service will be held at Nubbin Ridge Cemetery at 2 p.m. on Friday, January 25, 2019. Ethel was born in Oklahoma to James and Tennie White on December 19, 1924. During her free time she crochet lap robes and afghans to donate to the nursing homes. She also took donated sheets to make hospital gowns out of them. Ethel was the family anchor who always brought the family together and also kept everyone in the family up to date on others. She was a loving mother, grandmother, great grandmother, great great grandmother and sister. She is survived by her daughter, Louise Stevens and husband Johnny; grandsons, David Stevens, Chris Brown; great grandsons, Levi Stevens and wife Becka, Cooper Stevens; great great granddaughters, Lexi Stevens, Mackenzi Stevens; sisters, Margie Blount, Clovis Williamson; and numerous nieces, nephews and cousins. Ethel was preceded in death by her parents; husband of 40 years, Louis Mullenix; son Michael Mullenix; daughter Pamela Garza; and 4 sisters. Services are under the direction of Martins Funeral Home.